Mike Gooding, among other things, is an Emmy Award-winning journalist whose name and face are synonymous with 13News Now. He currently serves as senior military and political reporter. Mike began working at the station in 1985 and has filled many roles in his time here: assignment editor, show producer, sports and news anchor, general assignment reporter, and photographer. He has traveled extensively throughout the world to report on military affairs. That includes covering Operation Southern Watch (enforcing U.N. no-fly zone over Iraq/reporting from Bahrain and USS Nimitz, 1997, and Saudi Arabia, 1998), Operation Allied Force (NATO air strike campaign on Kosovo/reporting from Adriatic Sea and Albania, 1999), Operation Enduring Freedom (U.S.-led air strikes against al Qaida in Afghanistan/reporting from USS Enterprise and USS Theodore Roosevelt in Persian Gulf, 2001), and Operation Iraqi Freedom (reporting from USS Harry S. Truman in Eastern Med, off Cyprus, 2003 and from Balad, Iraq, 2004). 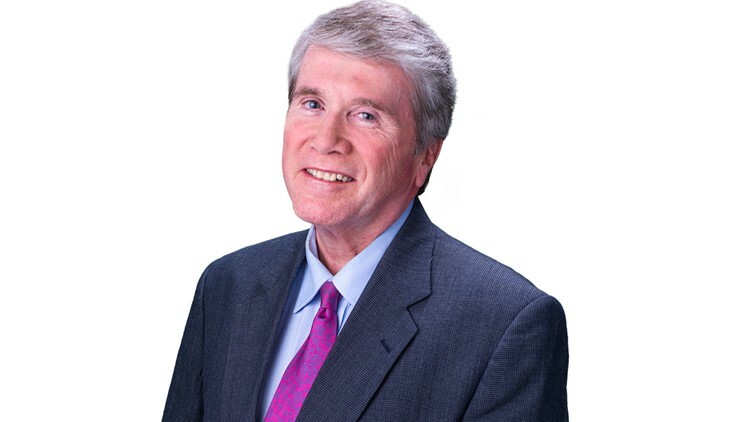 Mike won the Virginia Association of Broadcasters' 2013 George A. Bowles, Jr. Award for Distinguished Performance in Broadcast News. He received an Emmy from the National Capital Chesapeake Bay Chapter of the National Academy of Television Arts and Sciences for News Special, "BRAC Battle: Target Hampton Roads" (2006). Mike garnered Emmy nominations for Documentary "Stretched Too Thin" (U.S. Air Force Operations in Saudi Arabia-1999); Public Affairs Program "The Healing Journey" (U.S. Army search for M.I.A. remains in Vietnam-2000); Public Affairs Program, "20th Annual Navy Christmas" (2006); Documentary-Topical "Navy Christmas at Home and Abroad" (2007); News Special "Sequestration: Finding our Future" (2014); Military Program/Special "A Century of Service, Naval Station Norfolk, Then and Now" (2018). He won the 2007 Virginia Associated Press Meritorious Award for Outstanding Effort by an Individual Reporter at a Television Station for his half-hour special, "Final Flight of the F-14." He won the 2006 Virginia Associated Press award for Outstanding Effort by an Individual Reporter at a Television Station for his series "Gitmo: An Inside Look" which examined how War on Terrorism detainees are classified and treated at Camp Delta at Guantanamo Bay, Cuba. Mike has covered numerous sessions of the Virginia General Assembly, national political conventions, Virginia gubernatorial inaugurations, and presidential inaugurations. He also served twice as President of the Virginia Capitol Correspondents Association. Before television, Mike worked for three years for Byerly Publications (based in Franklin, Va.) as an editor, writer and photographer. Mike was born in Rhode Island, is a 1977 graduate of Annandale High School in Fairfax County, VA, and a 1985 graduate of Old Dominion University, where he served as Editor-in-Chief of the student newspaper, The Mace & Crown. He and his wife Donna and their two Corgi's live in Virginia Beach, they have two grown children. You can email Mike as well as follow him on Facebook and Twitter.